Borderlinx | Buy Shoebuy and ship worldwide with Borderlinx. Cheap rates guaranteed. Let nervousness about purchasing shoes online become a thing of the past! Shoebuy USA is one of the most trusted and most stocked online shoe retailers ever created. Founded over a decade ago, Shoebuy USA features over one million products from which to choose, including footwear, apparel, accessories, and more, and all shoes come in an impressive variety of sizes. Detailed fitting guides and attentive customer service representatives make finding the perfect Shoebuy USA item a breeze, and customers can shop without fear with free shipping and returns. With thousands of styles and sizing options to choose from, there's something for everyone at Shoebuy USA! Shoebuy USA selections are unbeatable, with thousands of styles and well-respected brands to browse, and hundreds of thousands of customer reviews to help you pick your perfect items. Shoebuy USA stocks footwear for women, men, and kids, and supplies a wide selection of trendy clothing options, backpacks, hats, watches, sunglasses, and more! Whether you're gearing up for a bike trip or for date-night, Shoebuy USA footwear and apparel have you covered. With many items listed for under $100 or even $50, along with the site's frequent sales, there's something to fit every pocketbook as well as every shoe size. 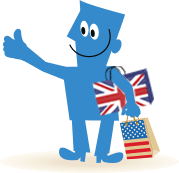 With Borderlinx, international customers can now buy Shoebuy USA, and Borderlinx will ship your order to your home country! Our Shipping cost calculator determines your cheap shipping, tax & duties upfront, and a number of additional services are available through Borderlinx to make international ordering from Shoebuy USA hassle-free, including concierge, free repacking and consolidation!